The ATI Powermodule T5 High Output Pendant is the perfect merger of world class engineering, elegant design and high end components. The ATI Powermodule is perfect for the truly serious hobbyist who values style and performance. The Powermodule features Miro Silver reflectors and an active cooling system for unmatched performance and long lamp life. Its stylish, heavy duty, curved housing give it a sleek, sophisticated look. Superior design and high-end components produce 50% more light than most equally sized T5 fixtures. 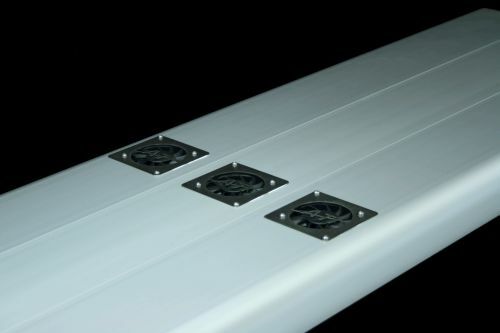 The active cooling system allows tubes to run at a more optimal temperature, improving tube life. The sleek, heavy duty silver colored body is durable, rust proof and only 2.3 inches high. All components, including the T5 ballasts, are enclosed inside the fixture housing. The only items external to the pendant are a small junction box, two power cords, and an AC/DC adapter to power the fans. 8 Tube Units. Circuit 1, Tubes 1 & 2 & 4 &5 & 7 & 8. Circuit 2, Tubes 3 & 6.